Ethan Fletcher at Diablo Dish reports that Oakland's got yet another craft brewery in its midst: Let's all give a warm welcome to the aptly named Oakland Brewing Company, which is apparently up, running, and temporarily operating out of other local beer facilities while renovations are being made on what will be its permanent location on 22nd Avenue. Meanwhile, Fletcher also reports that three Pyramid alums are set to open Elevation 66 Brewing Company, a brewpub on San Pablo in El Cerrito, sometime in May. We're a little late on this one, but according to Grub Street, the Telegraph Avenue space formerly occupied by Akasaka has been reborn as a second Bacheeso's location. What would a week in the foodie universe be without Chez Panisse news? According to Eater, as part of the lead-up to the restaurant's fortieth anniversary, each week, chef Alice Waters and her underlings will be preparing a special menu in homage to a chef or cookbook author that's inspired the Cal Cusine movement. Meanwhile, Waters is using her newfound Twilebrity well, having April-fooled this morning that she's the sass behind Twitter sensation Ruth Bourdain. Funny. Tower of Bauer comes out with his annual list of the Top 100 Bay Area restaurants in this weekend's Chron, but he released the list of this year's additions on his blog earlier this week. Among those 26 are three East Bay restaurants: Oakland's Plum and A Cote, and Berkeley's Ippuku. Notably absent from the list: Commis, Oakland's only Michelin-starred restaurant. Bay Area purveyor of raw food (and potentially sketchy management practices!) 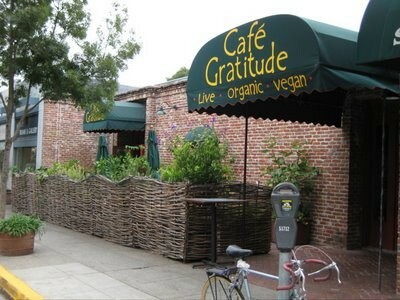 Cafe Gratitude is apparently introducing a new, more comfort-food-oriented menu and reducing prices at all seven of its locations, including Oakland and Berkeley. Review revue: The CoCo Times delves into the rough and tumble world of the East Bay brunch scene, and they find three spots worth checking out (Berkeley's Sea Salt>, Lafayette's Artisan Bistro, and Oakland's Rockridge Cafe).